On January 21, 2017, millions of protestors took part in the Women’s March, and many of them created a “sea of pink” when they wore knitted pink “pussyhats” in record numbers. The pussyhat swiftly found its place on the cover of TIME and the New Yorker, and it ultimately came to symbolize resistance culture. Creator of the Pussyhat Project, Krista Suh took an idea and built a worldwide movement and symbol in just two months. But like so many women, Krista spent years letting her fears stop her from learning to live by her own rules. Now in DIY Rules for a WTF World, Krista Suh shares the tools, tips, experiences, “rules,” and knitting patterns she uses to get creative, get bold, and change the world. From learning how to use your own intuition to decide which rules are right for you, to finding your inner courage to speak up fearlessly; from finding what your passions are (this might surprise you!) to dealing with the squelchers out there, DIY Rules for a WTF World not only inspires you to demolish the patriarchy, but also enables you to create your own rules for living, and even a movement of your own, all with gusto, purpose, and joy. 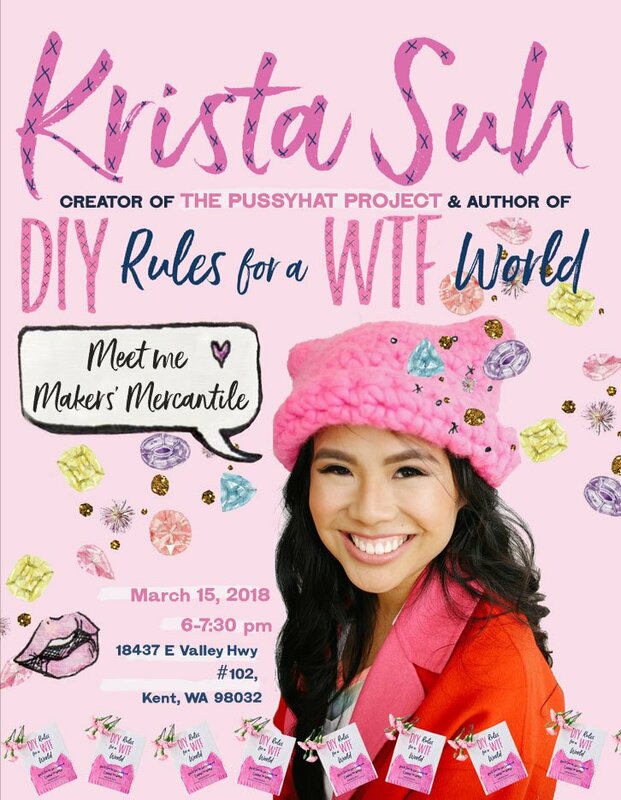 Join us to meet Krista, and to have your copy of DIY Rules for a WTF World autographed. Purchase your copy of the book HERE. Krista is a feminist, artist, activist, Hollywood screenwriter, and creator of The Pussyhat Project. She wants to make the world a safer place for women and to help everyone validate their own creativity, femininity, and intuition. Krista is the author of the upcoming, DIY Rules for a WTF World: How To Speak Up, Get Creative, and Change The World (Grand Central Publishing, January 2018.) She lives in Los Angeles.